The Old Fashioned Lavender Organic Hand Lotion is a smooth lavender, clove & vanilla. No soapy or pungent lavender, it’s a nice version that when mixed with the clove, becomes earthy & a touch of vanilla gives it warmth. Made in the USA! 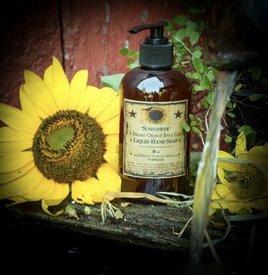 The Sunflower Citrus Liquid Hand Soap is a delicious blend of rich orange spice cake. Oils used are natural & skin safe. This is a refreshing scent to wash your hands with. Made in the USA! 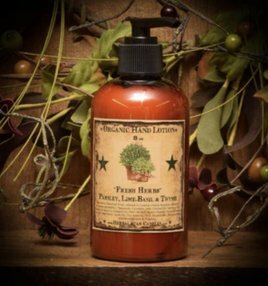 The Fresh Herbs Organic Hand Lotion scent is a blend of parsley, lime-basil, & thyme. It smells very herbal, but with the freshness of a greenhouse & the garden. It’s become the perfect scent to use around the home, especially in a kitchen. The Lemon Daisy Hand Soap is a scent of freshly baked lemon biscotti. Smells just like baked lemon cookies! The oils used are natural & skin safe. The Home Organic Hand Lotion is a new blend of spiced vanilla & almond. The oils used are natural & skin safe. This TOP SELLER is made in the USA! 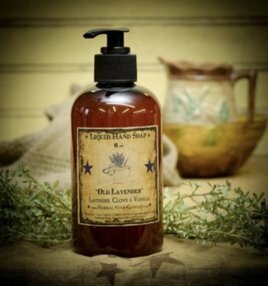 The Old Fashioned Lavender Liquid Hand Soap is a smooth lavender, clove & vanilla blend. This isn't soapy or pungent lavender…it’s a nice version that when mixed with the clove, becomes earthy & a touch of vanilla gives it warmth. The Fresh Herbs Liquid Hand Soap is a refreshing blend of parsley, lime-basil, & thyme. It smells very herbal, but with the freshness of a greenhouse & the garden. It’s become the perfect scent to use around the home, especially in a kitchen. 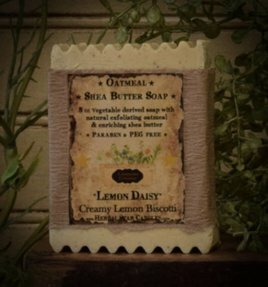 The Lemon Daisy Oatmeal Shea Bar of Soap is a refreshing scent of freshly baked lemon biscotti. The oils used are natural & skin safe. It's 8 oz & is a vegetable derived soap made using Natural Oatmeal & Shea Butter. It is Paraben and PEG free. 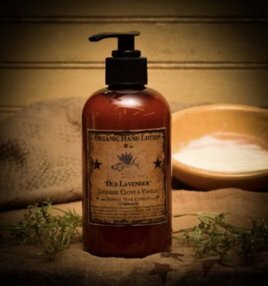 The Home Liquid Hand Soap is a blend of spiced vanilla & almond. The oils used are natural & skin safe. A delicious scent to use year round! Made in the USA! The Apple Krisp Kringle Liquid Hand Soap is a blend of yummy spices & warm apple crisp. It is not too sweet, & not too spicy, it’s a warm scent. It is so good that you'll want to try other fragrances too. Made in USA. The Pumpkin Star Patch Organic Lotion is a fall favorite made of sweet & spicy pumpkin pie. The oils used are natural & skin safe. This scent is sure to remind you of a cool Fall afternoon. Made in the USA! The Orange Clove & Spices (also formerly known as Angel Star Light) Liquid Hand Soap is a blend of orange cloves & spice. You will love this delicious scent. The oils used are natural & skin safe. Made in USA.